At the ANA annual meeting, researchers at the University of Michigan reported that a high-fat diet mouse model induced neuropathy similar to what is observed in patients with pre-diabetes and type 2 diabetes. Researchers trying to identify the best therapeutic approaches for diabetic neuropathy have been stymied to date by the paucity of animal models that reliably characterize the salient features and complications of human diabetes. But in new research presented at the American Neurological Association (ANA) annual meeting in Chicago last month, scientists at the University of Michigan reported that they found a mouse model that comes closer to addressing that challenge. The high-fat diet mouse model induced neuropathy similar to what is observed in patients with pre-diabetes and type 2 diabetes, they said. “Diabetic complications, including peripheral neuropathy, are traditionally thought to be due to hyperglycemia,” said study author Lucy M. Hinder, PhD, a postdoctoral fellow in the laboratory of Eva Feldman, MD, PhD, FAAN, director of the A. Alfred Taubman Medical Research Institute and Program for Neurology Research and Discovery in the department of neurology at the University of Michigan. “But our clinical research and work in the lab suggests that tightly controlling blood glucose is not sufficient to prevent the development or progression of peripheral neuropathy in type 2 diabetes,” said Dr. Hinder. An emerging concept is that diabetic neuropathy is associated with metabolic syndrome, and not hyperglycemia alone, she added. “Peripheral neuropathy can also develop in people with pre-diabetes and metabolic syndrome (involving obesity, impaired glucose tolerance, dyslipidemia, and hypertension) who do not have hyperglycemia,” she explained. “Something in addition to the high glucose is clearly injuring these peripheral nerves, but how these metabolic factors converge to damage the peripheral nerve is still very much the question. In the current study, the researchers worked with several strains of mice fed the same high-fat diet for the same length of time, charting the longitudinal changes in nerve fiber function and measures of pre-diabetes. The strain that came closest to mimicking what is observed in pre-diabetic patients is the Jackson Laboratory's C57BL6 or BKS mouse strain, which is one of the most widely used animal models of type 2 diabetes. When the mice are bred with the diabetes mutation, the obese BKS mice develop severe diabetes. This animal model was developed by mixing strains of mice that are resistant to diabetes with animals that are susceptible to diabetes. To learn more about an effective mouse model, Dr. Hinder and her colleagues fed six different mouse strains either normal chow or a high-fat diet that contained 54 percent of calories from lard. The high-fat diet was started when the animals were five weeks old and stopped when they were 36 weeks of age. All of the mice developed high-fat diet-induced neuropathy. But of the various strains, the model for the genetically modified C57BL6 mice developed neuropathy the earliest and seemed to best reflect what is observed in patients with pre-diabetes and type 2 diabetes. By 36 weeks, this model “exhibited the most comprehensive metabolic syndrome phenotype, with insulin resistance, liver steatosis, adipocyte hypertrophy, and elevated LDL cholesterol and oxidized LDL,” she said. The model also provided insight into the effect that a change of diet could have on symptoms, Dr. Hinder said, describing another study she discussed at the ANA, in which she and her colleagues experimentally investigated pre-diabetic peripheral nerve injury mechanisms. They began reducing the high-fat diet in the C57BL6 mice at 20 weeks of age. The mice had been on a high-fat diet since they were one month old. Four weeks after they resumed a diet of normal chow, the animals showed completely normalized large fiber function, had lost weight, and had improved glucose tolerance. Their LDL cholesterol and oxidized LDL had recovered by 50 percent compared with high-fat diet control mice, the researchers reported. •. Hur J, Dauch Jr, Hinder LM, et al. The metabolic syndrome and microvascular complications in a murine model of type 2 diabetes http://diabetes.diabetesjournals.org/content/early/2015/05/14/db15-0133. Diabetes 2015: 64(9): 3294–3304. •. Hinder LM, Vivekanandan-Giri A, McLean LL, et al. Decreased glycolytic and tricarboxylic acid cycle intermediates coincide with peripheral nervous system oxidative stress in a murine model of type 2 diabetes http://joe.endocrinology-journals.org/content/216/1/1.long. J Endocrinol 2013; 216(1): 1–11. •. Callaghan BC, Hur J, Feldman EL. Diabetic neuropathy: One disease or two http://journals.lww.com/co-neurology/pages/articleviewer.aspx?year=2012&issue=10000&article=00005&type=abstract. Curr Opin Neurol 2012, 25:536–541. 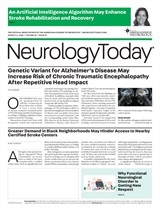 Neurology Today15(19):36-37, October 8, 2015.